Manchester United saw a £35m offer for Nigerian international striker Odion Ighalo rejected by Watford during the January transfer window, according to a report in theMirror. 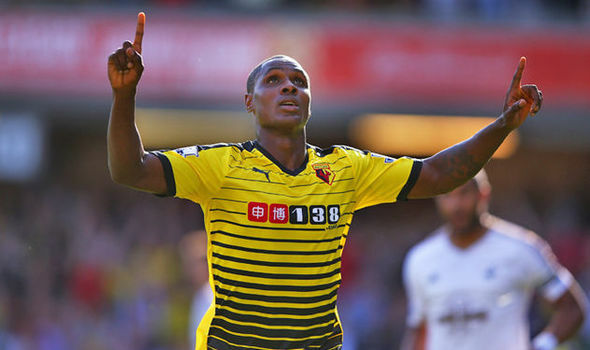 Ighalo has been excellent since joining Watford from Udinese in 2014 with the striker netting 20 goals in 38 games to help the Hornets clinch promotion to the Premier League during his first season in England. He continued that fine form during his debut season in the Premier League with the striker netting 16 goals as well as providing 5 assists in his 37 appearances as Watford finished a very respectable 13th in the table last season. Unsurprisingly, Ighalo’s impressive performances attracted interest from the upper echelons of English football and the Mirror are citing a report coming from the Times that claims Manchester United launched a bid for the striker back in January. It’s claimed by the newspaper that former United boss Louis van Gaal targetted Ighalo as a key target during the winter window but the Red Devils were left frustrated as Watford knocked back their £35m offer. However, United aren’t expected to renew their interest in the Nigerian international this summer as Jose Mourinho has his own targets in mind and the Portuguese coach has already brought in super-star Zlatan Ibrahimovic to compete with Wayne Rooney and Marcus Rashford next season. Watford have resisted the opportunity to cash-in on Ighalo and team mate Troy Deeney in recent months with both strikers the subject of big-money offers as the Hornets look to establish themselves as a top flight team next year.